Green Fairy: Do I see her if I drink Absinthe? 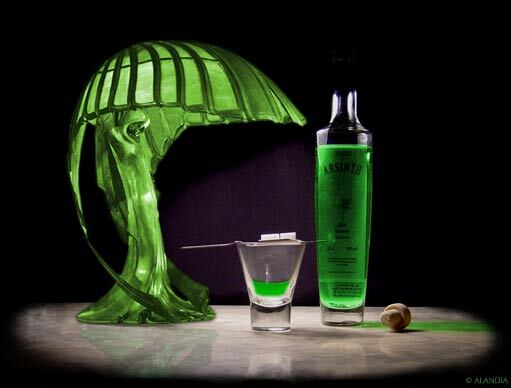 The liquor Absinthe is also known under its nickname the "Green Fairy". Many myths and stories surround this green lady. But the Green Fairy is not fictional, the lady of Absinthe can be experienced. Because you can buy a bottle of real Absinthe online. Fortunately Absinthe is legal, even in the USA. You can read more about the legal status of the Green Fairy at our specifc info site. In the following paragraphs we will present some more information about the drink itself. Does the Green Fairy appear after drinking some glasses of Absinthe? What will happen if I drink a glass of the Green Fairy? The best way to drink the Green Fairy..? If you want to drink Absinthe the authentic way, you have to perform the classic Absinthe Ritual: You need an Absinthe spoon, an Absinthe glass, some sugar cubes and a water carafe of Absinthe fountain for this drinking ritual. Do not prepare the Green Fairy according to the "Czech Fire Ritual". This means you should not light up the green liquor. The fire destroys not only your beautiful accessories, but also the fine taste of the herbal spirit will be negativele affected. It would be like mixing a good glass of wine with Coke. You simply do not do it. You should drink the Green Fairy according to the original French Ritual, where you only add ice cold water and sugar - no fire. Take a look at our Absinthe video below showing the French Absinthe Ritual. Absinthe is distilled with wormwood. The oil of this plant contains thujone. It is the epitomous ingredient of the Green Fairy. It is sometimes as well spelled "thujon". Thujone is linked to Absinthe as it is said that this ingredient is responsible for the Absinthe effect. There are many misunderstandings about this ingredient and the effects of Absinthe. We have created a specific info site about Absinthe & Thujone where you can find our more. The Absinthe effects are caused by the high alcohol level of the Green Fairy. Or have you every drank 140 proof liquor before..? Vodka, Whiskey, rum, they all "just" have 80 proof. Definitely Absinthe will not make you freak out. If you know people telling you stories about this, ask them, how they drank Absinthe. We are pretty sure that they consumed the spirit as a shot, which you should never do. Absynthe (latin spelling) is just too strong to be drank neat. You should always drink it the traditional way as described above, with water and sugar. Santé.